Queen Margrethe always arrives to the New Year banquet in a flurry of fabric and jewels, with her trademark Yeti pelt fur wrap swinging. This year was all of that times ten, because her gown - a repeat from her 70th birthday celebrations - ended up looking like she was wearing two gowns at once under that wrap. 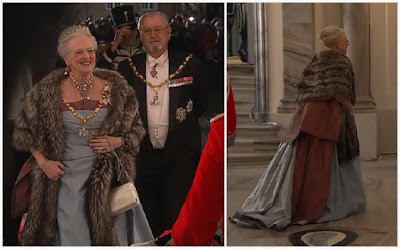 She's also wearing the stomacher from the Danish crown pearl, ruby, and diamond set as a necklace. That's a lotta look by itself, let alone with the gold chain and the Pearl Poire Tiara and all the rest. Luckily, she's a woman with enough gravitas to pull it all off. Crown Princess Mary opted to start the new year by testing my love of capes. This is the first time we've seen her Jesper Høvring gown in action (she wore it in a portrait last year), and it is a golden dream, very swoopy and grand in motion. (Check out video of the royal family's arrival here or here.) I'm just afraid it's being let down by the cape, which doesn't feel magnificent enough to go with this gown. 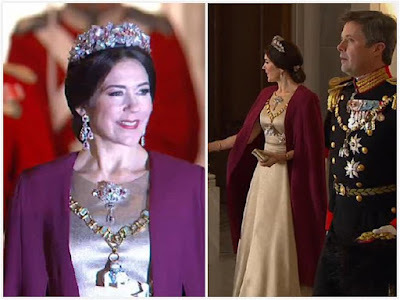 I'm with her on the rest of it, though: the Danish Ruby Parure with the full version of the earrings, the hair pins in back, and the brooch used at her neckline. Fabulous. I couldn't believe it when Princess Marie got out of the car: could she really be wearing a simple, slinky metallic sheath? She usually adds some froof to the equation. And so she had and I just didn't see it right away, in the form of a ruffle at the side of this new Ole Yde gown. The ruffle is subtle, and the bronze color makes an excellent showcase for her golden collar. Her Diamond Floral Tiara is never a bad idea. I think this might be her best New Year outing in quite some time. ANN screencaps. See video here. An impressive amount of sparkle here even with fewer tiaras than usual, because some family members are still observing mourning for Prince Mikasa. 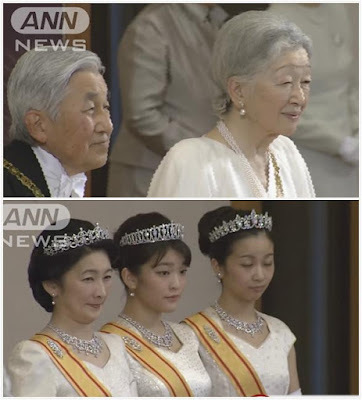 Empress Michiko no longer wears tiaras, but was elegant in pearls; the ladies of the Akishino family came with the full force of their diamond parures (Princess Kiko in the Akishino Tiara, plus Princess Mako in her tiara and Princess Kako in her tiara.) Crown Princess Masako arrived in the Japanese Pearl Sunburst Tiara. Who's your best dressed to kick off the new year?